The most popular version is the Mercator projection, created by Flemish cartographer Gerardus Mercator in 1569. It's been widely used for centuries, including today in various forms by Google Maps and many other online services. This map preserves directional bearing, presenting rhumbs (imaginary lines that cut all meridians at the same angle) as straight lines, thus making it a useful tool for navigation. Despite its benefits, the Mercator projection drastically distorts the size and shape of objects approaching the poles. This may be the reason people have no idea how big some places really are. Alaska is nearly as large as the continental U.S.
Greenland is roughly the same size as Africa. Europe (excluding Russia) is only a bit larger than South America. Antarctica dwarfs all the continents. Alaska can fit inside the continental U.S. about three times. Greenland can fit inside Africa about 14 times. South America nearly doubles Europe's land mass. Antarctica looks like the second-smallest continent. Now, an astute reader may avoid these errors by noting the elongation of latitudes in parts of the map. 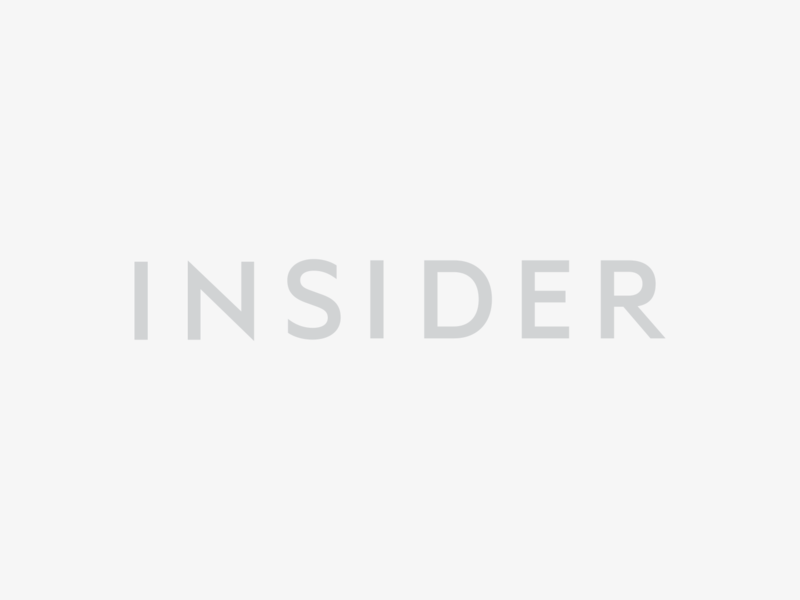 But to most people, the Mercator projection is highly misleading. Tissot's indicatrix, a geometric equation used to show distortion on maps, explains the problems with Mercator. 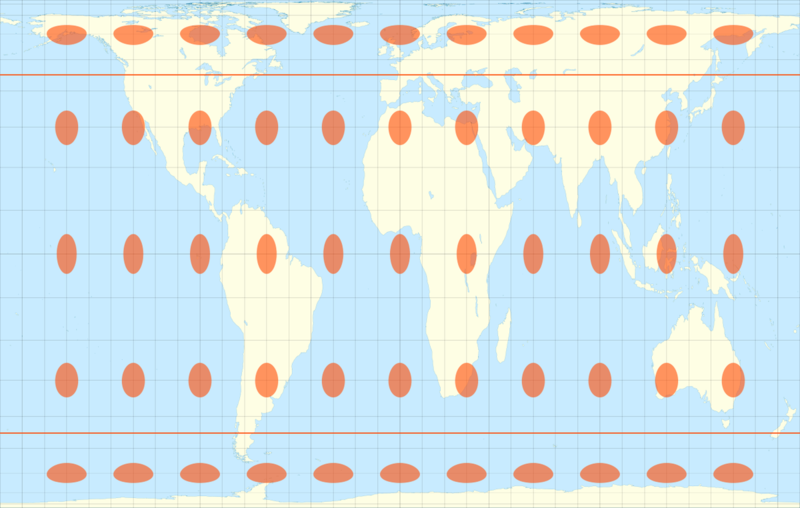 The Mercator projection with Tissot's indicatrix. 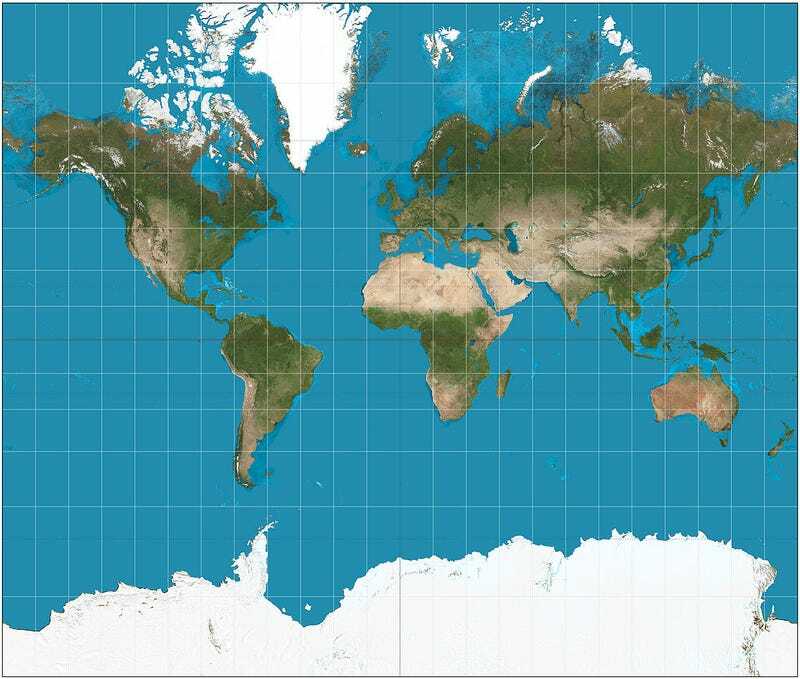 One of the best alternatives to the Mercator projection was presented in 1974 at a conference in Germany by Dr. Arno Peters, who claimed he invented it — though well after the discovery of an identical map made by James Gall in the 1800s. 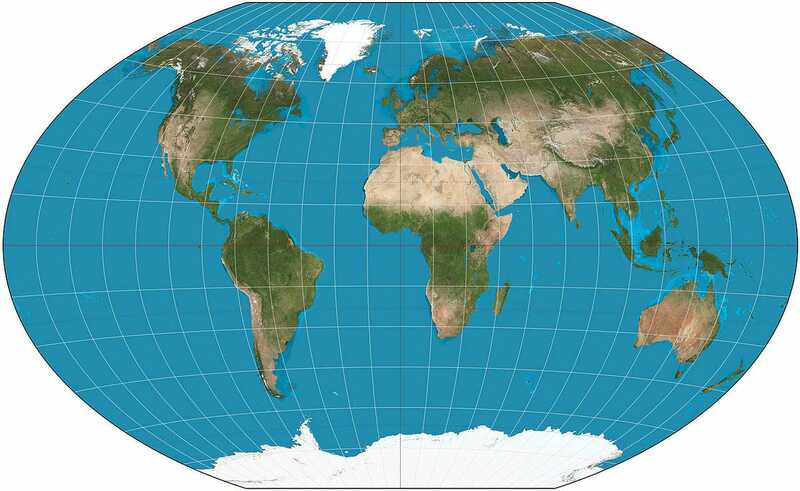 The Gall-Peters projection (shown below) makes seeing the relative size of places much easier. Notably, this version comes closer to showing that what we percieve as land mass in the "South" is nearly twice as big as the "North" — 38.6 million square miles compared to 18.9 million square miles. The Mercator, however, makes the North look much larger. Therefore, Peters argued, the Mercator projection shows a euro-centric bias and harms the world's perception of developing countries. Despite these benefits, the Gall-Peters projection has its flaws. It doesn't enlarge areas as much as the Mercator projection, but certain places appear stretched, horizontally near the poles and vertically near the Equator. 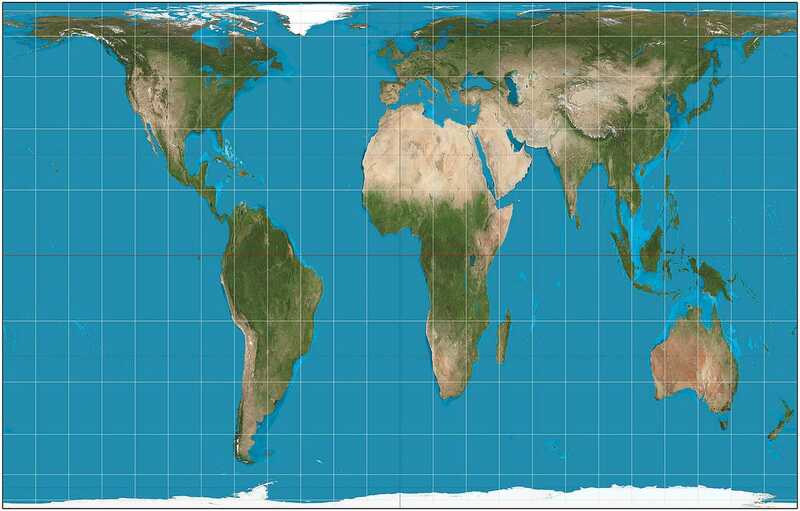 The Gall-Peters projection with Tissot's indicatrix. You may remember this map from season two, episode 16 of "The West Wing," when a group of cartographers visit the White House to ask that the president "aggressively support" requiring every school in America to teach geography using the Gall-Peters instead of the Mercator. Don't worry, the show's press secretary C.J. Cregg didn't understand either. 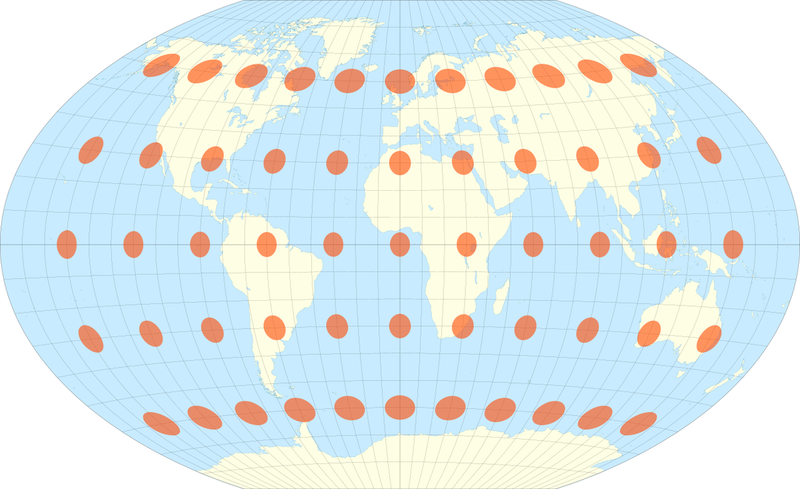 To make matters even more complicated, tons of map projections exist. A popular one is the Winkel tripel projection, invented by Oswald Winkel in 1921 and named for his "tripel" (German for "triple") goals of minimizing distortion of area, direction, and distance. It does the job pretty well, and the National Geographic Society adopted it as the standard map in 1998. Many schools followed suit. The Winkel tripel projection with Tissot's indicatrix. In conclusion, understand your map before you try to understand the world around you. And remember, Greenland and Africa aren't the same size. Publicado por Agustin Besoain en 12:14 p.m.